I’ll admit it. I’ve been very lax with my chickens. I would finish milking and open their gate to let them forage for the day. They went all over. Then the gray fox moved in. 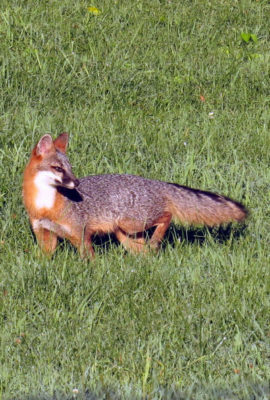 When I first moved here, a gray fox lived up on the hills behind the house. How did I know it was a gray and not a red? I saw it climb a tree, something only grays do. 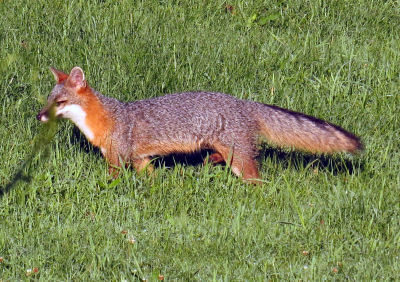 Shortly after dawn the gray fox was out in an unmowed section of lawn looking for mice or voles. It is welcome to all of those and any moles it catches. Foxes love chicken dinner. The resident fox caught one of the chickens one day. It was stupid enough to come across the street to the house which puts a big sign over it: Eat Me. The fox wanted to oblige. I disagreed. I ran the fox down and rescued my chicken unharmed. The chicken went back to the coop, flew out, got caught again and rescued again. This time it got the idea. The present fox won’t run down the road with a chicken. It runs across the road and up into the brambles. I’m also older and slower. 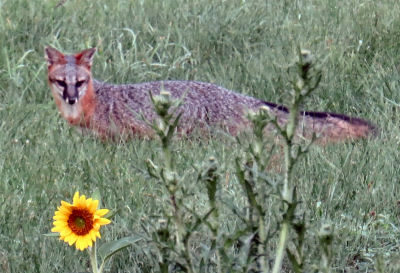 The gray fox knew I was out taking pictures. It didn’t run off. It took time to watch the cats. It looked me over. It sauntered off. Evidently I’m becoming a slow learner too as ten hens disappeared before I kept the chickens locked up. They are disgusted. The fox is disappointed. I am glad to stop losing hens. The usual method for dealing with a gray fox is to trap or shoot it. Since no fox has called the place home for over fifteen years, I don’t want to kill the fox. Another method is to get a dog. We don’t want a dog here for many reasons, wildlife being one of them. We enjoy seeing buck deer, turkeys, all sorts of birds in the backyard. The gray fox seems to show up at any time of the day. I had thought they would be nocturnal, but this one definitely isn’t. That makes protecting the chickens more difficult. That leaves both the chickens and me adjusting to our new resident gray fox. The chickens stay in their coop except for an hour before their bedtime when I am back and forth to keep an eye on them. They tend to stay around their coop then instead of roaming to the house or the creek. The fox is determined to have chicken dinner. We played the game of “Fox sneaks after chickens, I chase fox” several times one afternoon. The hen house doors are locked at dusk every night. The people door has an extra hook on it down low. This keeps raccoons out too. So far this is working. And it lets us enjoy both the chickens and the gray fox. This entry was posted in Ozark Hills and tagged gray fox, protecting chickens on July 25, 2018 by [email protected].